Ibaraki is Japan's number one producer of melons, in terms of both production area and amount, and a number of varieties are grown here. 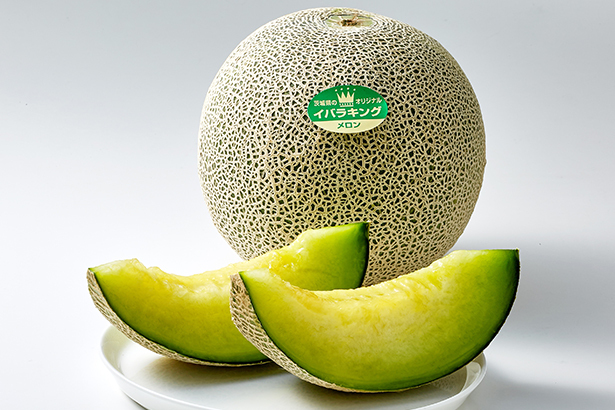 The 'Andes' and 'Quincy' varieties, as well as the 'Otome' and 'Takami' and Ibaraki original brand 'Ibaraking' varieties, are grown from spring to early summer, and the 'Earl's' variety is grown from summer to autumn, so you can enjoy delicious melons for around half of the year. Sophisticated flavor and taste, "King Class"
Original cultivated variety birthed from more than 400 combinations of crossbred melons. The name of 'Ibaraking' comes with the wish to become the king of melons in Ibaraki. During the more than 10 year development process, more than 400 combinations of crossbreeding were tested with the male parent being a variety of the Earls melon and the female parent selected from 40,000 varieties. This is how the best melon, 'Ibaraking' was born. What makes 'Ibaraking' special is a sophisticated flavor and sweetness, smooth mouthfeel, and fine and juicy flesh. Good news is that its shelf life is relatively long too. Another major feature is the fleshiness of the fruit. 'Ibaraking' grows 10% bigger than a usual spring melon. 'Ibaraking' is the taste of spring in Ibaraki. Please give it a try! Hokota City, Ibaraki is the largest producer of melons in Japan. Cultivation of 'Ibaraking' started in 2011 in Hokota City. 'Ibaraking' is quite senstive to weather conditions so its farming can be challenging. However, its excellent quality and taste have been highly valued. We, JA Hokota Melon Committee, have not only measures to counter extreme weather, but also strict standards of shipping to ensure timely delivery to customers. 'Ibraking' which meet our strict standards are labeled as "High Quality Ibaraking" and are our positioned brand's leader and sold at department stores in the Tokyo metropolitan area. Ibaraki prefecture is the largest producer of melon. There is a large selection of brands such as "Otome", "Andes", "Quincy", "Takami" and "Earl's", and you can enjoy these from spring through to fall. "Ibaraking", the original Ibaraki brand is popular due to its refreshing sweet flavor. We mainly grow the large variety of grapes but we've also started growing European grapes such as Muscat and Rosario, and recently our original and unique grape variety the "Hitachi Seiryu". Our fruit garden is very popular and attracts visitors from all over Japan. The best season is from summer through to fall. Cultivation of our popular varieties such as "Kousui" and "Housui" covers more than 90% of our farm area, but we've also been working on the introduction of new varieties such as "Kanjyuku nashi" which are ripened on the trees and "Chozou nashi" which you can enjoy in winter. Contain high level of Vitamin C and can be enjoyed in preserves such as jam and also in juice. Ibaraki prefecture is most famous for the "Tochiotome" brand but we also grow "Ibarakiss", which has a meaty texture and is a rich and sweet flavored variety of strawberry. Chestnuts are very popular fall-season nuts.Ibaraki prefecture is the largest producer of them and there are more than 10 different kinds of varieties.You can roast, steam, sweetened (after boiled) or paste them depending which one you use. Branding also has been becoming popular in the chestnut production, and "Kiwami", which is made by keeping them in a low temperature storage in order toimprove the sweetness, is one of the creation. 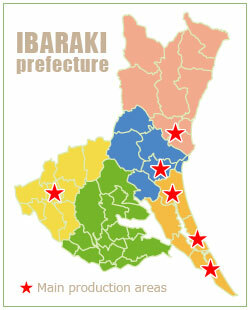 Ibaraki prefecture is the number one producer of of rice in the Kanto area and 3rd in Japan. This area is blessed with beautiful rivers such as Tonegawa, Kinugawa, Nakagawa and Kujigawa and a mild climate, so rice cultivation has been one of the most popular agricultural pursuits for quite some time. Each region has its own unique methods of cultivation which is highly regarded throughout Japan. This vegetable is produced around "Kasumigaura" which is the second largest lake in Japan. This area is the first largest producer of lotus root. The hollow areas present in a lotus root supposedly represent a view into ones future and is why the lotus root is seen as a "good luck" food. The presence of Polyphenol, Mucin and Tannin in lotus root is believed to help ease the symptoms of hay fever. This vegetable is one of the popular ingredients in salads and is frequently used as garnish for various meat dishes. Also recently you see it in soups and pan-fried dishes. There are two different types of lettuce; the familiar round shape one, and secondly the 'leaf lettuce'. This is very rich in Vitamins, Potassium and Fiber. We have some brands of sweet potato such as "Beni azuma" which have a very fluffy texture and, "Benimasari" which has a higher water content and hence a more wet texture. You can grill, steam or deep-fry depending which one you use. Sweet potatoes are also used in variety baked goods and are even used in Shouchu (distilled spirits). The Kashima area in Ibaraki prefecture has a mild climate and is a well-drained area, and is perfect for the cultivation of green pepper. These are normally in season in summer but since the use of greenhouse cultivation, you can enjoy tender and delicious green peppers all year round. They are rich in Vitamin C, potassium and beta-carotene. This vegetable is very popular due to its distinctive crispiness and texture. It was originally grown in Kyoto but now Ibaraki is the number one producer. You can use it fresh in salads or you can add it to various dishes such as boiled salad and Nabe-dish (hot-pot dish). It's very rich in iron and calcium. Tomatoes come in many varieties, sizes and colors. It adds color to cooking and dishes. The Lycopene in tomatoes dissolves in oil and is heat-resistant, so even after cooking the goodness is still present in the tomatoes. Burdock is well-known for its distinctive fragrance and texture. It's a fiber- rich vegetable and is known to promote intestinal health and to help reduce cholesterol. The polyphenol present in burdock root acts as an anti-oxidant and has been garnering a lot of attention in recent years. Ibaraki prefecture is the largest producer of Napa Cabbage in Japan. During the 'Nabe-dish' (hot-pot dish) season, which runs from November to January, the Napa Cabbage from Ibaraki accounts for more than 80% of the total sold in the Tokyo Central Wholesale market. It is low in calories and rich in potassium, and is believed to prevent hypertension and remove unneeded sodium from the body. The majority of Shiitake mushrooms in Ibaraki prefecture are grown using the log cultivation method. Mushrooms grown using natural logs are often called "abalone mushrooms" because of their meatiness, rich flavor and fragrance. It's low in calories and rich in fiber and potassium. Since it holds its shape in cooking and has a great crispy texture, you can use this vegetable in a variety of dishes. You can also enjoy a "Bok-Choy Salad" which you can eat raw and the 'grassy smell' has been reduced through careful cultivation of this variety. This vegetable has quite a long history as the name is mentioned in Japan's oldest historical record such as "Kojiki" and "Manyoushu". It's very rich in beta-carotene and Vitamin B, C and E. Allyl sulfide which is the source of the distinctive fragrance is believed to enhance the absorption of Vitamin B which is known to aid recovery from the fatigue. This is one of the more popular varieties of deeply colored vegetables. "Souwamiyako Kabocha (pumpkin)" grown in the Koga-city and "KABOCHA" grown in the Inashiki-city are well established as the leading brands and both will be harvested and shipped only when they are fully ripe, so that you can fully enjoy its fluffy texture and natural sweetness. Large black scarlet runner beans are successfully cultivaated in Ibaraki prefecture. As the name suggests, they are famous for their beautiful glossy black color and size: approximately 2cm. They contains three times more Anthocyanin, a type of polyphenol, than black soybeans. This adds a bright yellow color and sense of summer with its crispy texture and sweetness. It contains linoleic acid which is known to reduce cholesterol, sweetcorn is also a rich source of fiber. In order to have it delivered in the best possible condition to our customers, it is refrigerated immediately after it is harvested and then shipped immediately. These are caught mainly in spring and in fall off the coast of Ibaraki prefecture. They are usually dried and steamed during preparation, however fresh baby anchovies are also becoming popular these years. Freshwater clams are in season in summer and in winter. And the ones harvested in Hinuma area are large, with a beautiful glossy black colored shell. The meat is full-flavored and adds the Umami component. One of the seasonal and very popular white fish, which you can enjoy from the late fall up to winter. It's a very delicate fish with a light and exquisite flavor, and you can serve it both as sashimi and cooked in sauces. This fish is highly regarded at Tukiji Fish Market and it's also registered as 'prefectural fish'. The Sea of Kashima has vast sandy beaches stretching from Oarai to Hasaki, and the clams from this area are large and meaty. They are rich in succinic acid (Umami component), and used in classic dishes such as 'Ushiojiru (clams in clear soup)', 'Yaki Hamaguri (grilled clams)' and 'Sakamushi (steamed clams in sake)'. While blow fish is known as the fish of choice in the west of Japan, monk fish is believed to be the fish of choice in the east. The monkfish liver contains high levels of Vitamin A and the taste is believed to be equivalent to foie gras. You can enjoy delicious monkfish in various areas in the prefecture from late fall to early spring. This is one of the most popular fish in Kasumigaura-Kitaura (which is one of the lakes that makes up Lake Kasumigaura) and, alongside the famous sailing net-fishing, is a unique and recognized symbol of Kasumigaura-Kitaura. This can be cooked in a variety of ways, such as: sweetened (after boiled), dried and grilled. These have been popular local products for quite some time. You can also enjoy it deep-fried or marinating in sweet and vinegary sauce (after deep-frying). Selected farmers experienced and skilled in beef production are charged with the cultivation of this breed. Only the best quality meat is stamped with the "Hitachigyu" brand, to ensure customers only get the finest quality beef. This beef melts in the mouth and has a very delicate texture and distinctive flavor. This product is a popular brand which represents Ibaraki prefecture. The Pigs, their feed and the farmers are carefully selected to enable the production of a tender and richly flavoured meat with a moderate fat content. This local breed of gamecock takes twice as long to raise and are given a specially-selected feed, and are reared in the beautiful setting of the Okukuji area. Its meat is quite lean and has a very rich flavor to it. A food made from steamed and dried sweet potatoes. Rich in dietary fiber and potassium, and having a gentle sweet taste, this product has become popular as a healthy food product. "Hitachi Fall Buckwheat Noodles" are a gem born in Ibaraki. These noodles have an elegant greenish pearly color, a nice sensation when swallowed, and a strong aroma, and are a must try! When one speaks of Ibaraki, natto always comes to mind. Natto is a traditional fermented soybean dish. It has gained attention as a high-protein, low-fat health food.